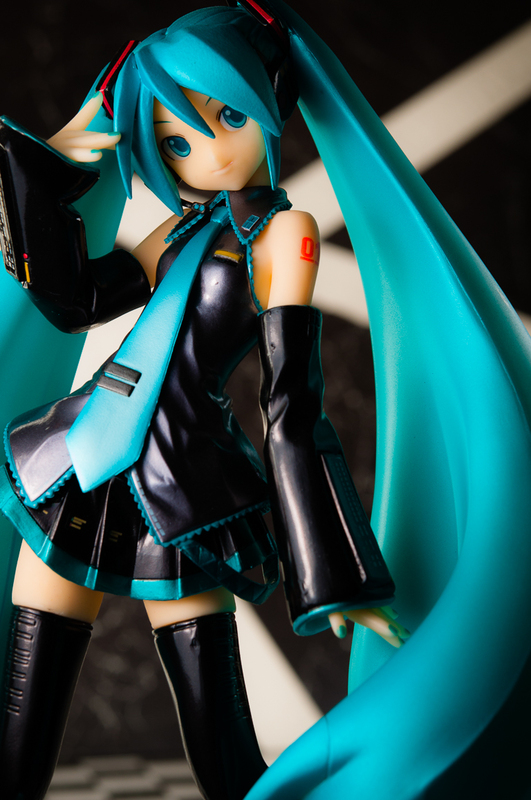 It’s hard to imagine now, but there was once a time when Hatsune Miku figures were a rarity. If memory serves, Good Smile Company and Volks were the first two companies to put out PVC figures of the now-iconic virtual idol. 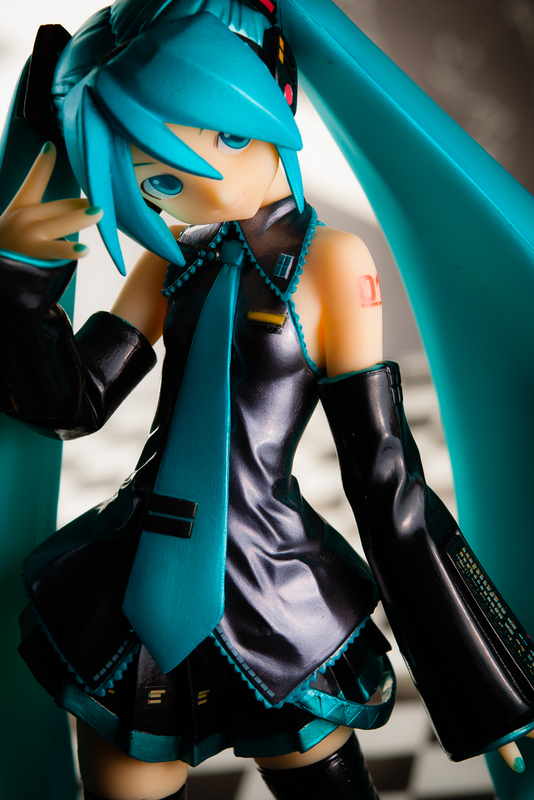 I owned both at one time, but I decided I preferred the Volks version, and subsequently sold off GSC Miku. 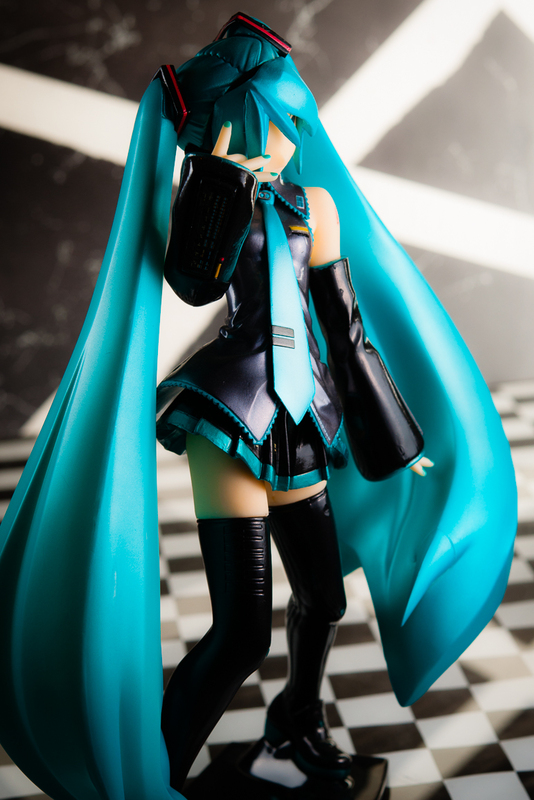 Unfortunately, Volks Miku was always a bit overshadowed by the circumstances under which I acquired her. Like all Volks releases, she was an exclusive and she arrived at a time when I really didn’t have a very good understanding about how to go about acquiring such figures. I ended up enlisting Tokyo Hunter‘s help to locate a copy for me well after release and the total cost with proxy fees and shipping came out to about $250, which wasn’t entirely unreasonable at a time when this figure was going for 18-20K yen on Yahoo! 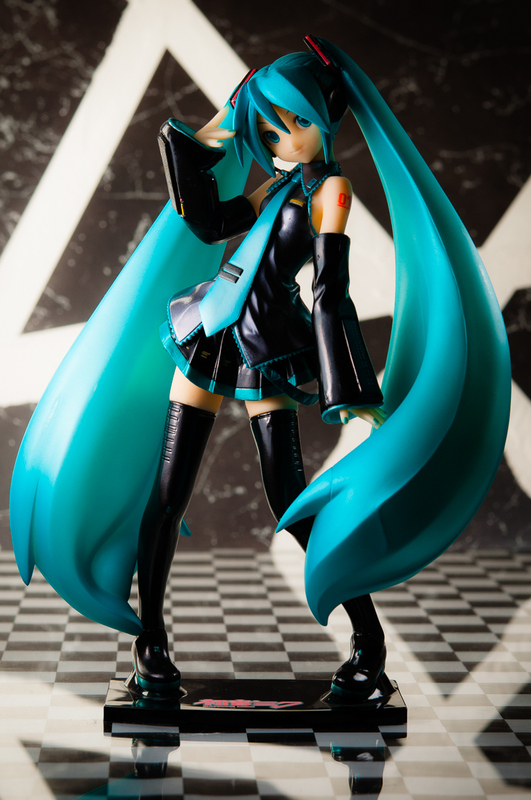 Auctions Japan, but it’s still a lot to put down on one figure even now and it doesn’t look like a great buy in retrospect given the abundance of Miku designs available today and the decline in value on this one in particular. 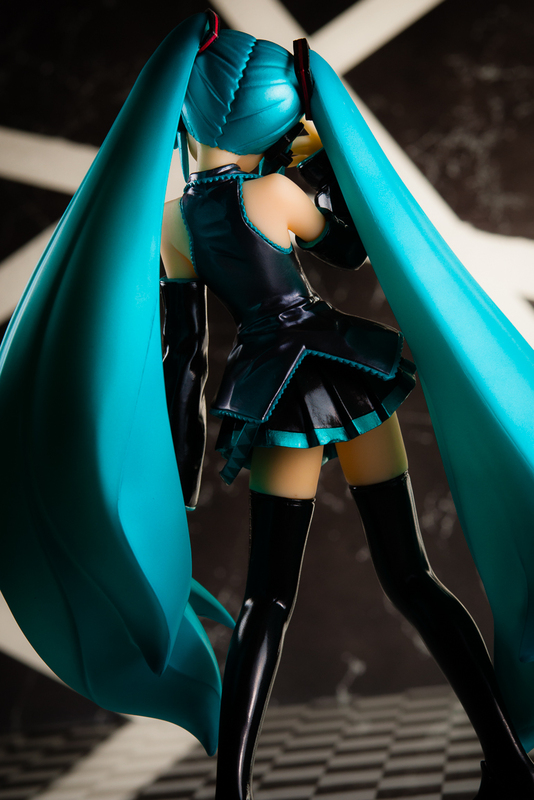 The most striking aspect of Volks Miku are her huge twintails, which are sculpted as solid masses rather than individual strands. It’s a bit unconventional and I’ve seen a few negative comments over that aspect of her design, but it never bothered me, personally. 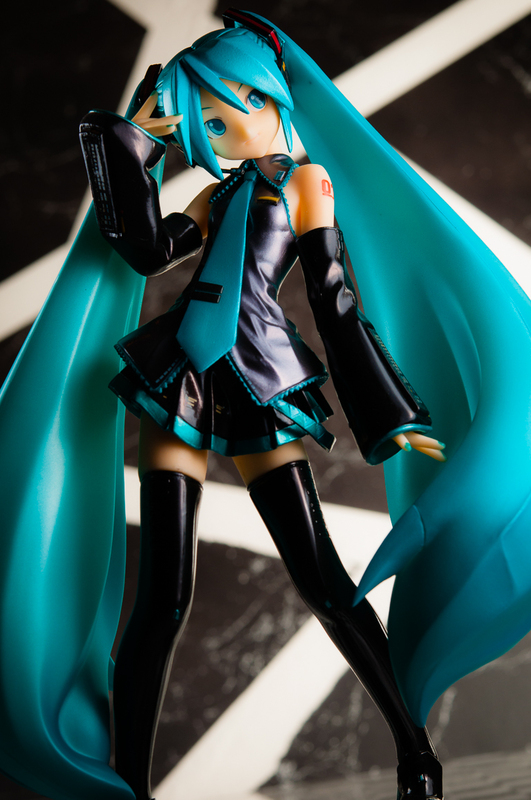 Miku’s right arm is interchangeable to adjust the pose slightly, which is a feature I never took advantage of outside of the photos for this review. This figure is officially 1/6 scale, but I find that sizing rather generous and I’d place her more in the upper 1/8 to lower 1/7 range. Quality-wise, this is rather mediocre figure. The finish is pretty rough in spots, particularly on the hair (but not the twintails, oddly) and along the edges of the tie. The figure does, however, look pretty good at normal viewing distances. 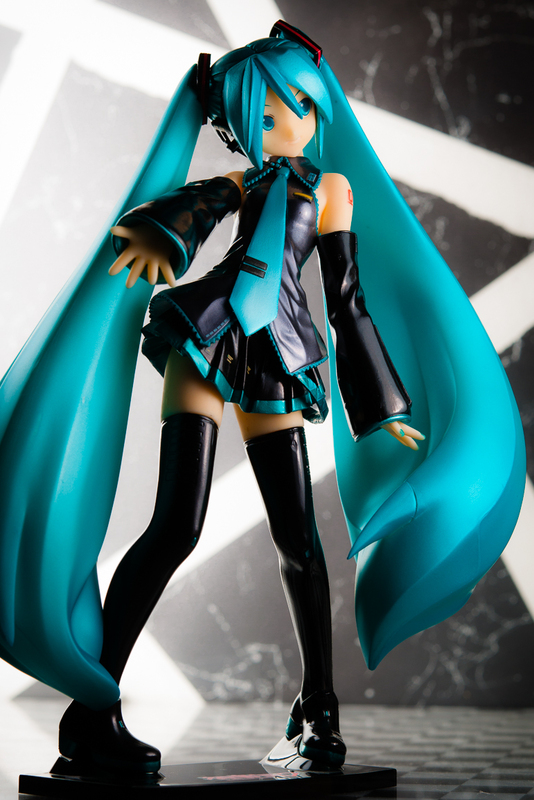 The display base is very simple, albeit oddly square when so many bases are circular, and features stylized text spelling out Miku’s full name. 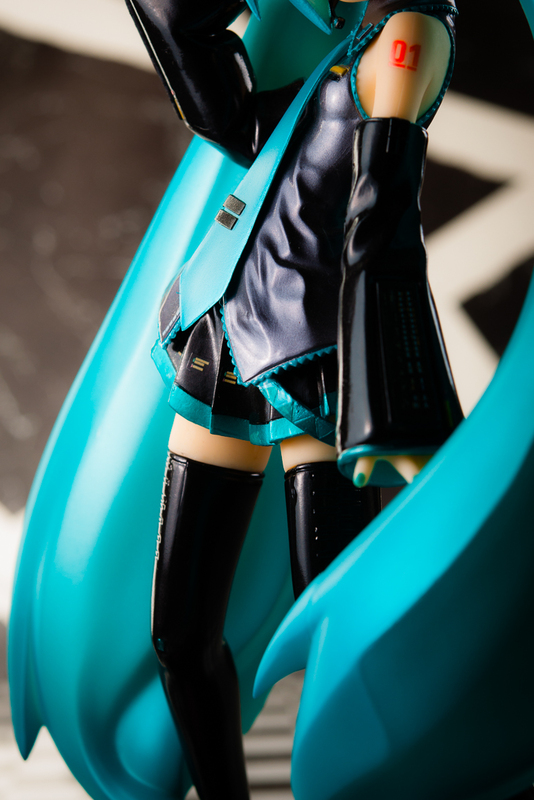 One notable aspect of the design is that the exposed pegs are actually on Miku’s feet rather than the base. The fit is a bit loose, but the figure is stable enough on the shelf. 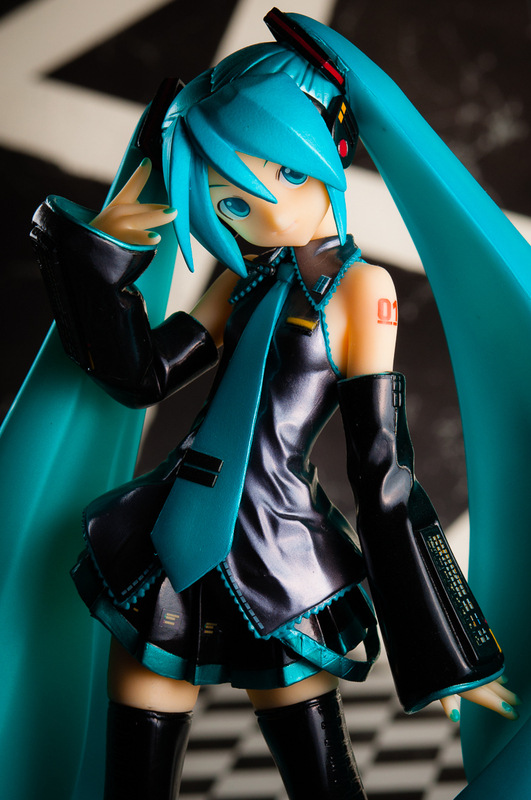 As I indicated earlier, I felt like this was the best of the early Miku designs, and it served me reasonably well as the representative Miku of my collection for the past five years or so. 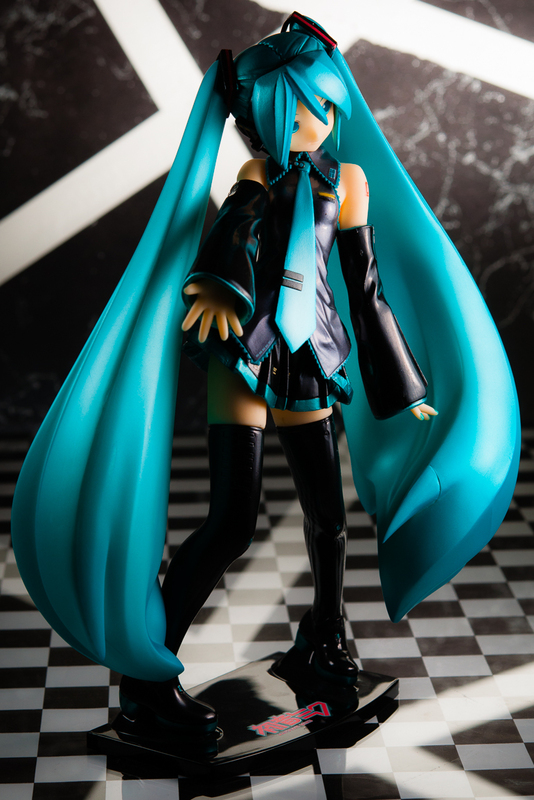 The figure hasn’t aged particularly well in the context of the many other options available at this point and if I was dead set on getting a figure featuring Miku in her classic idol outfit now, I would probably pick one of the Max Factory versions (standard and Tony version) instead. 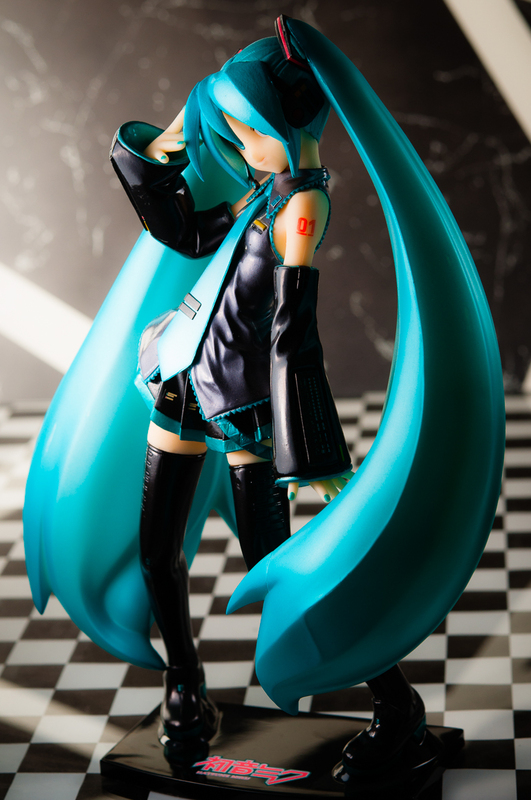 This entry was posted in Figures, Reviews and tagged 1/6 scale, Hatsune Miku, PVC, Vocaloid, Volks. Bookmark the permalink. Nice photos! I prefer the GSC version to to each his own! Thanks! Indeed, to each their own. Miku has been adapted so many different ways that there’s something to please just about everyone. Most characters are not nearly so fortunate. I think she looks really cool, the way she was sculpted as confident Idol on stage. The straight wing like twintails add something sci fi to her appearance. In 2008 interchangeable parts weren’t that common I like that Volks added it in their figure. 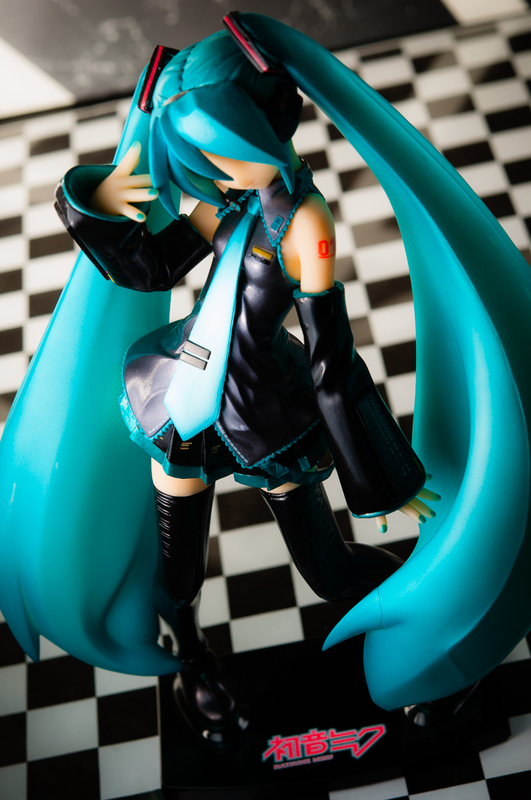 This Miku is definitely not as large as you would expect for its listed scale. I don’t know if that’s a Volks thing—their Horo is also listed at 1/6 and she’s similar in size to Miku—or an older figure thing, as I think the expectations for scale sizing may have shifted somewhat over time. The sizing is disappointing by today’s standards, but at the time of her release I didn’t feel like it was so much of an issue. 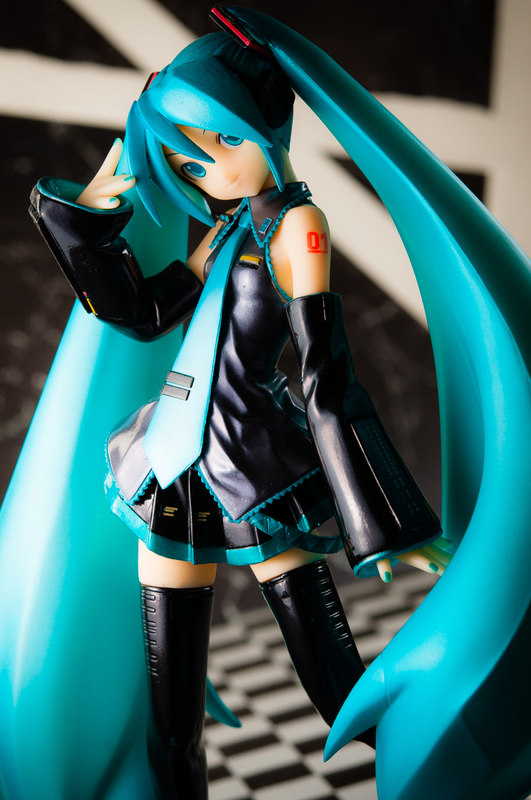 Come to think of it, I’m not aware of any truly large Miku figures out there. 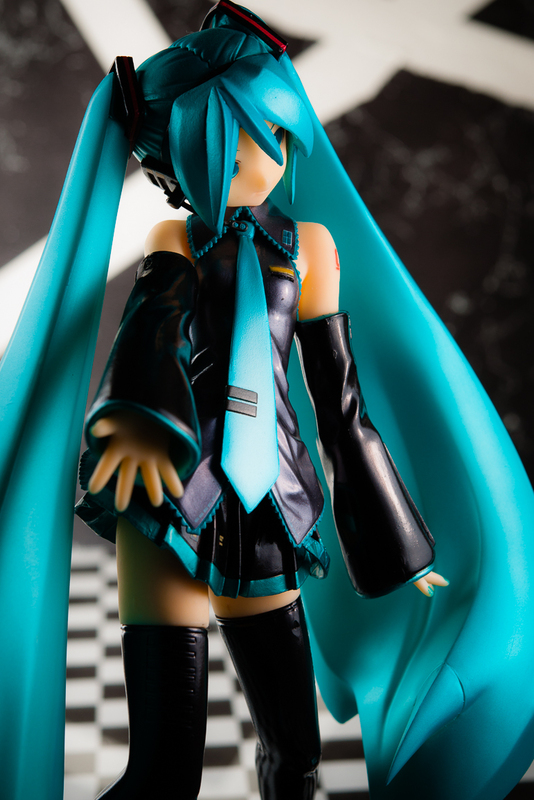 I might have picked up the Tony Miku if I didn’t have the Volks version when she was released. I’m a big fan of Tony’s work, so his involvement combined with the eye-catching pose made it an enticing design. Ultimately, though, I found it hard to justify having two figures of the same character in the same outfit and I didn’t consider selling Volks Miku at the time. I’ve since read that the Tony Miku has some design issues, so maybe it’s just as well that I didn’t reach for that figure. Hopefully this comment will go through since I’ve forgotten my WordPress password and there is no frippin’ way I’m ever using my Facebook account for anything … anyway, yeah, I’d agree she hasn’t aged well, and I don’t think the Max Factory one (with the similar pose) has, either. Those older figures still have a certain charm though, at least to people who were collecting at around that time. It’s a little funny to think now, though, that if one wanted a figure of Miku in her standard outfit, there aren’t really many contemporary options to pick from; in fact, the Tony one is the most recently-released one that I can think of, though I’ll admit I don’t really keep up with all the Miku figures out there. 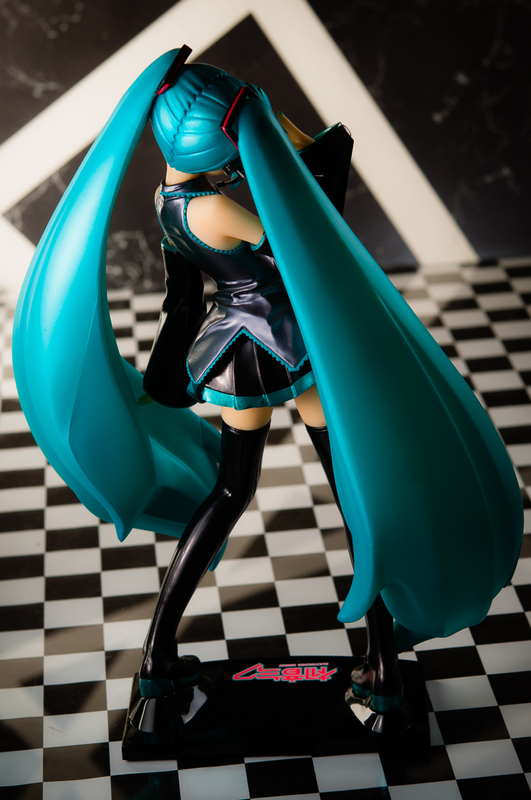 Of the three Miku figures with the same pose, the Volks one might be the least impressive one in terms of sculpt and manufacturing quality but I think I like her pose the best, at least with her arm bent upwards. I miss Tokyo Hunter; I used to use that service to buy all kinds of exclusive figures. There are a ton of places to buy such figures now but I always like to stick with what I’ve used in the past. No worries! Your comment went into a moderation queue, which I usually only have to do once per person. I’m pretty sure you’ve posted on her at least once before, though, so I’m not sure why this one didn’t go right through. Either way, not a big deal from my end. 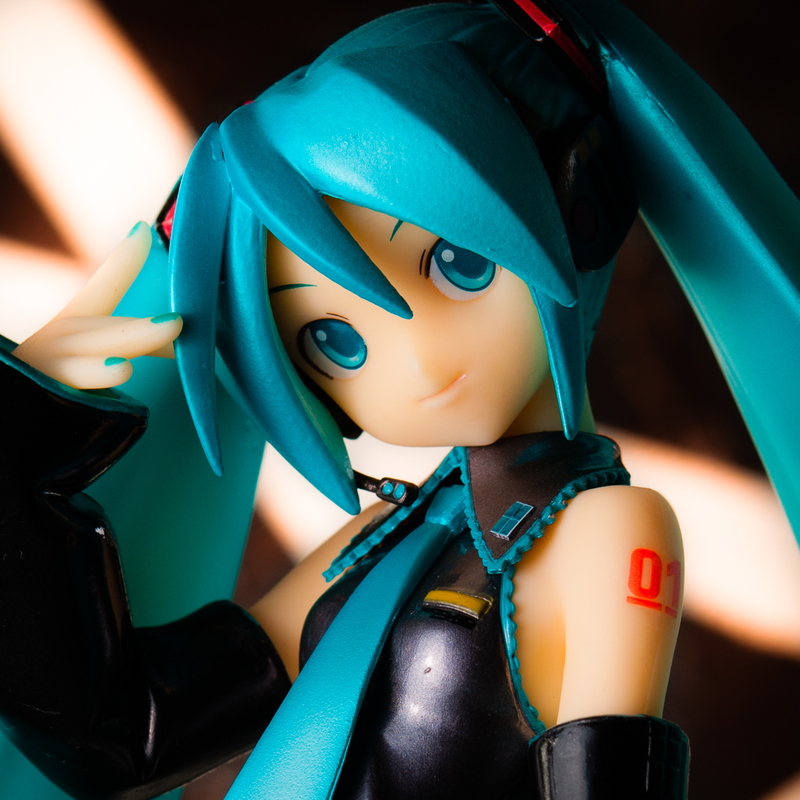 It’s a bit surprising to consider, given how many Miku figures there are in general, that so few feature her canonical outfit. The figure industry loves their popular heroines, but they never seem to want to iterate on a specific representation of a character too many times. (Which can be frustrating when the variant you like gets flubbed by whoever got the nod and no alternatives are forthcoming.) I guess Miku’s not so different from other characters in that regard. When was the last time you saw a new Saber figure featuring the blue dress? 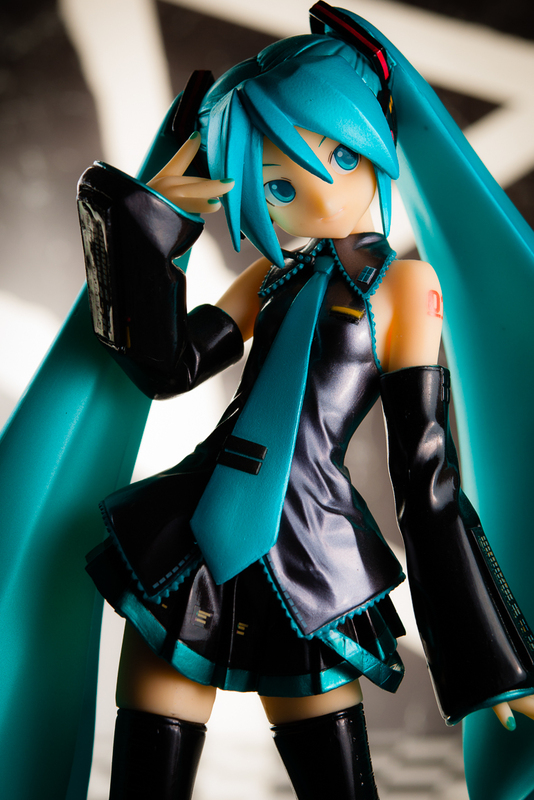 The other surprise is that there aren’t any truly large Mikus out there. All the GSC and Max Factory variants have been 1/7 scale or smaller. 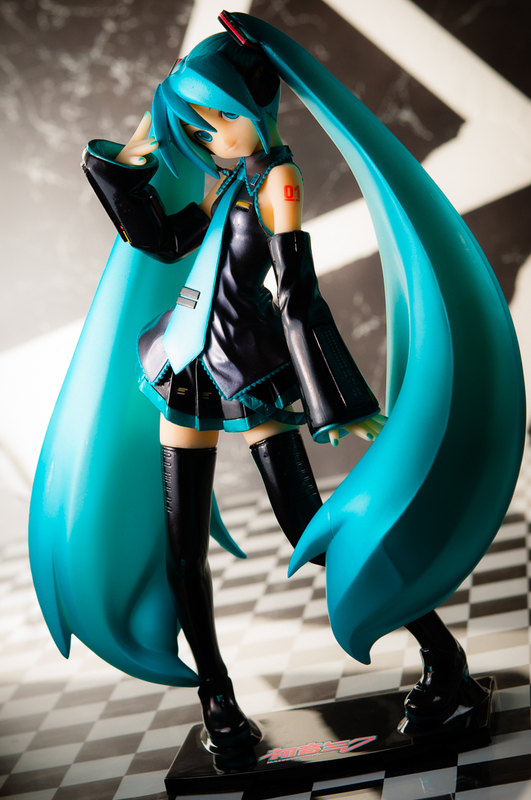 And Volks Miku is 1/6 scale in name only. I just discovered that FREEing showed off a 1/4 scale Miku in her classic outfit at WonFes, but that’s a very recent development. I only used Tokyo Hunter a few times, but I found Joseph to be consistently pleasant and easy to work with. It was a surprise to learn that his service has been dissolved and he’s apparently moved on to other ventures. We are fortunate to have more options today for proxy services, but his exit is still a loss for the community.